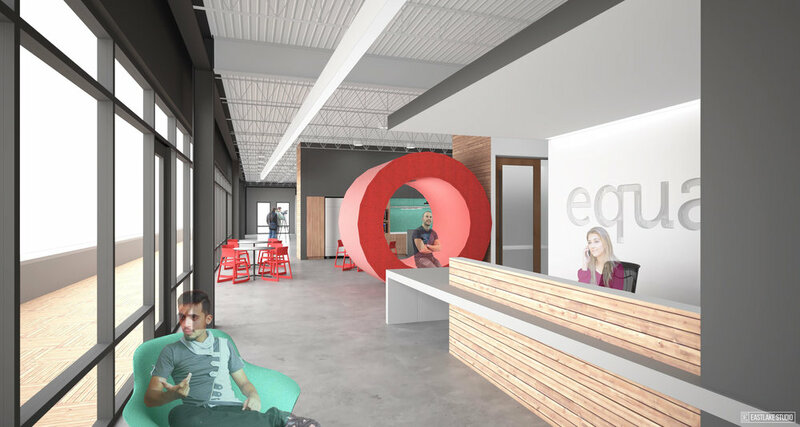 Equator Cincinnati, design and rendering by Eastlake Studio. We’re kicking off the new year by reflecting on our favorite design moments of 2018—project details, unrealized concepts and the memorable bits in between. 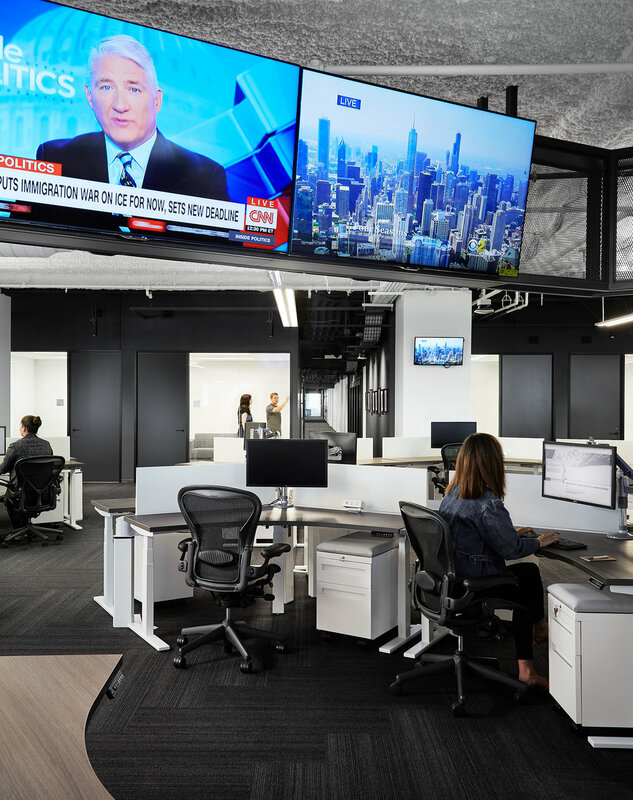 The media ring at the new Chicago Tribune workplace was designed specifically for the editorial team to help define their area on the floor and keep them up to date on breaking news. This was a special detail because all of the power/data and cable management is concealed in the structure of the media ring. It takes quite a bit of effort to make a double-sided TV center look clean and I think we accomplished this quite successfully. Though we haven’t formally photographed the space, my favorite thing this year was a circular booth Nicole and I worked on together. It was a showpiece for their space as it relates directly to their brand. Also, we incorporated a green wall in their conference and meeting room areas, and it turned out great. Some you win, some you don’t. The client loved many parts of the 1970s concept we came up with for them, including plaid wall covering and bold orange doors. They weren’t as excited about the beaded wooden curtain, however. I’m excited that our idea to add custom shelving in the reception area for action figures (picked out by staff in idealized self-representation!) will be installed soon. 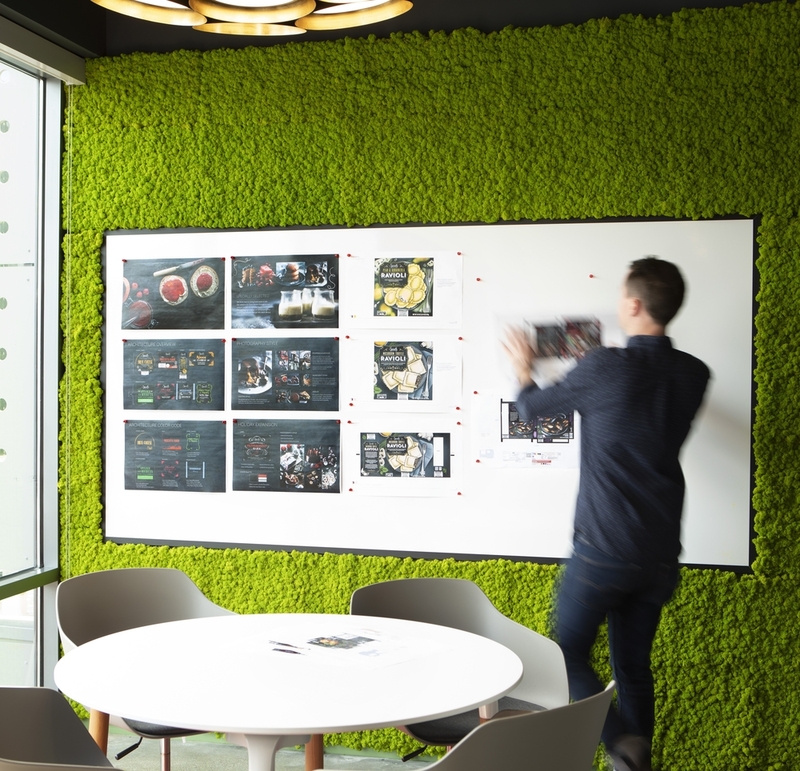 A bold graphic at the elevator lobby brings Sphera's “embrace symbol” to life, as it wraps both the horizontal and vertical surface, culminating in the logo on a moss wall. The clean, simple lines on the greenery, in combination with the sky blue graphic gives a nod to their sustainability values. I'm proud of it because we successfully addressed the CEO's request of making their logo and branding sing within an impactful entry sequence, while being cognizant of budgetary constraints. I loved seeing the transformation of a neutral spec suite into a cool and colorful office. 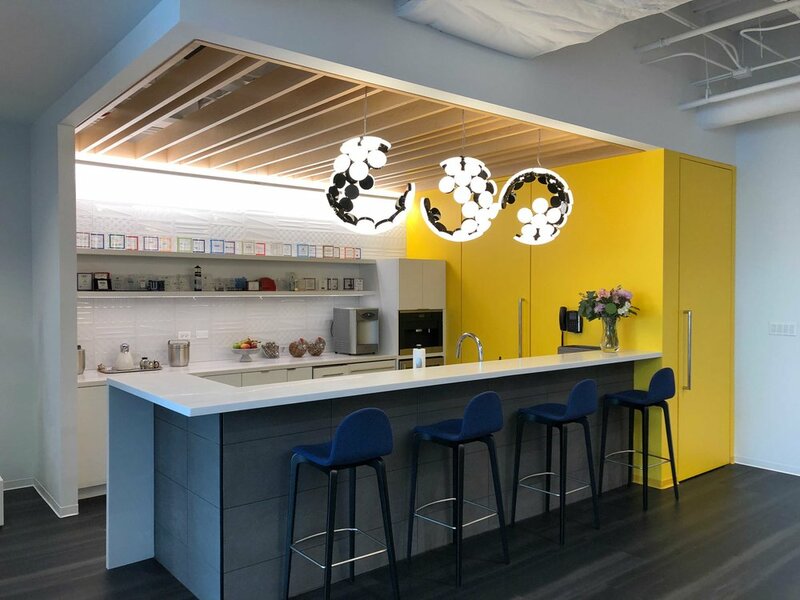 The bright yellow accents, textured tiles, wood features, and funky light fixtures really bring it to life. The project team was fun to work with. 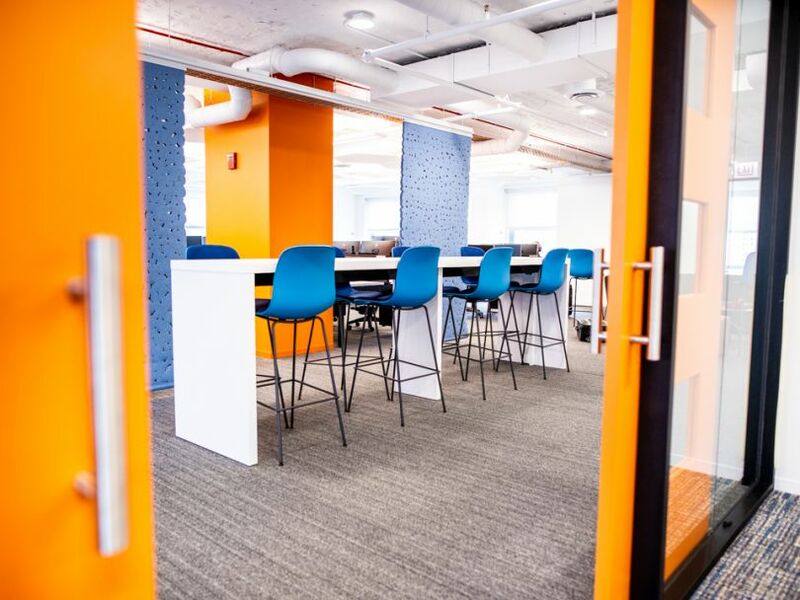 Erie Street Capital was open to new ideas, and Pepper Construction helped us make those ideas happen. One of the fun things we did at Showpad at 1 N. State was reference a casual outdoor cafe through the use of overhead string lights. 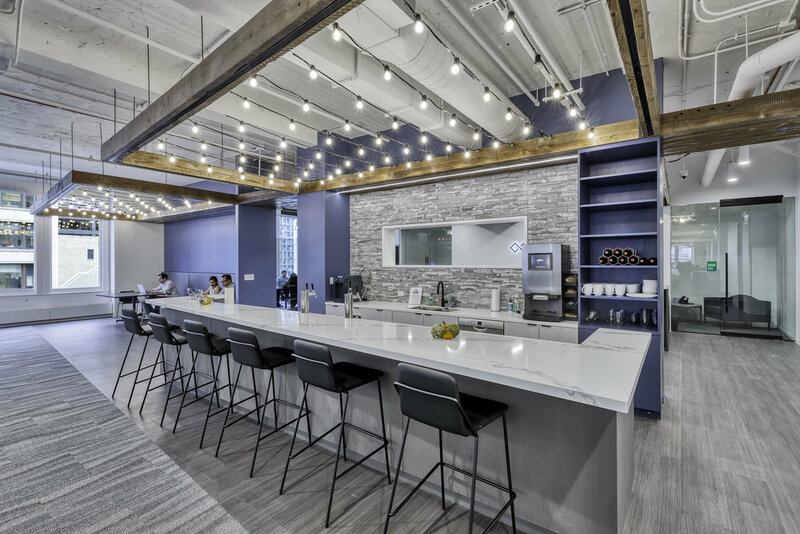 Working with the lighting manufacturer we were able to get approval from the building department for indoor installation, a first for this type of light in an indoor setting in Chicago. It’s exciting watching a space transform. Sometimes you create something striking, and then nature enhances it, as in the case of the late afternoon sun through the breeze bricks. This photo I shot during construction is one of my favorite images and projects of the year. I’m looking forward to seeing this spec suite through the final touches, and then having it captured by one of the great photographers we work with, Kendall from Hall + Merrick Photographers.